A photo of my grandfathers barn. Starting with my grandfather, my family raised llamas for nearly a decade before I was even born. It was almost a forgone conclusion that I would join in the tradition! Today it is primarily me and my brother Jacob who run the llama operation, though my dad still owns a handfull of females. I treat the promotion of camelids as a very high priority in my life. Llamas are the most beautiful, versatile, regal animals on the planet, and I believe that everybody should own one (or at the very least meet one!). To this end my family and I do as much public outreach as possible, primarily with our 4-H club, The Woolly Amigos. We allow city kids to use "loaner llamas" that they can train throughout the year and show at our county fair. We have public outreach events like our annual "Lunch with Llamas" day hike. We also look to bring more new people into the industry every year by consistently having affordably priced, well advertised stock available. We provide our buyers with tons of post purchase support, help get them involved in local 4-H clubs, and try to set them up for success as breeders if they choose that route. I love colorful, regal llamas! I like all llamas, but my ideal llama is a large, regal appaloosa with exotic fiber coverage. In the past year I have decided to emphasize color more in my program, and in came a slough of colorful animals including "Chileno Machupicho", one of the most colorful llamas i have ever seen. 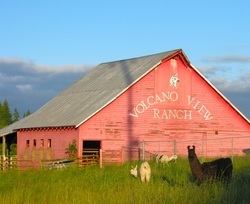 I hope to phase out of solid colored llamas more and more and hold a higher percentage of exotic paints and appaloosas. I have also brought in a few "Argentines" to look to add more head wool and lower leg wool to my herd. I don't breed llamas for the money, I breed them because they are fun! It is so neat to watch how different genotypes and phenotypes combine together to form a new cria. It is very rewarding to watch a llama that you bred succeed in your show string or breeding program, or in the program of someone else. I'm going to sound like a broken record on this one... babies are the best way to bring new people into the industry! New owners are able to start with a young animal and have it grow up with them. You never know when you might produce that knockout animal that will get people talking from coast to coast and truly put your program on the map. I have these aspirations for every breeding.